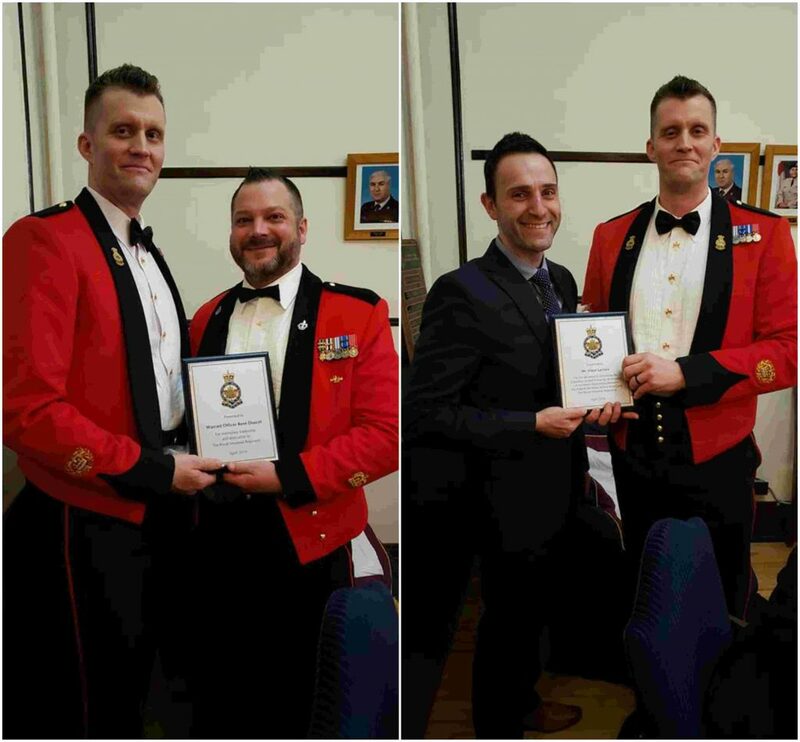 Westmount, Quebec – 14 April 2019: The Royal Montreal Regiment Warrant Officers’ and Sergeants’ Mess hosted their 103rd annual 2nd Battle of Ypres Dinner on Saturday evening 13 April 2019. The Regimental Sergeant-Major (RSM), Master-Warrant Officer Stephan Leroux, the President of the Mess Committee, Warrant Officer Andrew Anctil, and all members of the mess were delighted to host His Worship John Belvedere, the Mayor of Pointe-Claire, as the guest of honour for their dinner. Also in attendance was the Mayor of Westmount, Her Worship Christina Smith, the Commanding Officer, Lieutenant-Colonel John Shone, and the Honorary Lieutenant-Colonel, Lieutenant-Colonel (ret’d) Colin Robinson, and several former CO’s and RSM’s of the regiment. Former members of the Regiment, guests and serving non-commissioned officers of the RMR listened intently to Mr. Belvedere as he recounted his deep respect for the military, the special relationship that Pointe-Claire and the RMR have enjoyed since the early 1960’s, and how he hopes that eventually there will be a more concrete physical RMR presence in Pointe-Claire proper than the existing cadet corps. Following the dinner the RSM presented plaques to Warrant Officer René Doucet and Mr. Vincent Lacroce to recognize them for their contributions to both the mess and to the regiment. LEFT: Warrant Officer René Doucet receiving a plaque from the RSM for his exemplary leadership and dedication to The Royal Montreal Regiment. RIGHT: Mr Vince Lacroce receiving a plaque from the RSM for his devotion to promoting the Canadian Armed Forces by developing an excellent relationship between the English Montreal School Board and The Royal Montreal Regiment.